This compact design portable diaphram compressor provides you a convenient airbrush work. The injected aluminum body of high resistance is durable. It is much quiet than the piston type compressor during operation, The mechanisms are mounted on sealed oilless bearings. 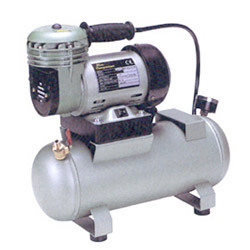 Therefore, the compressor requires no lubrication, This simply and easily permits an oil-free air supply. Suitable for all. 1. Electric motor: 1/8HP, 110/220V, 60/50Hz. 2. Air displacement: (1) 110V/60Hz,0.9CFM(25L/min). (2) 240V/50Hz, 0.75cfm (21L/min).